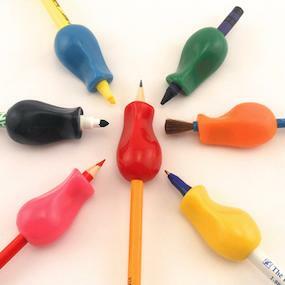 The Pencil Grip Jumbo provides more hand support and positioning for writing with less stress on painful hands. Extra large grip ergonomically designed to support the hand. Comfortable to grip soft rubber, latex free. 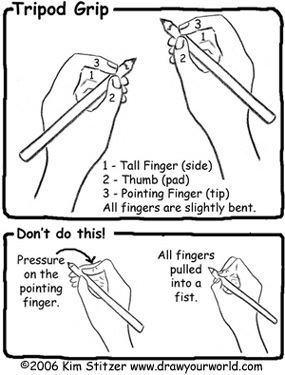 Helps prevent hand cramping, pain when writing. The The Pencil Grip Jumbo 6 Pack are 40% larger than The Pencil Grip Original, providing more hand support for people who have difficulty gripping. 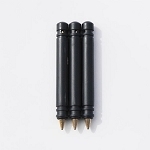 People with large hands, unable to close their hand, have poor hand grip will find these extra-large ergonomic grips help position their hand comfortably for writing. 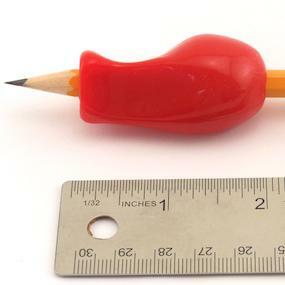 The Pencil Grip Jumbo has the same shape as the Original, but measures 2 inches long, 1 inch wide. The Pencil Grip Original is the number one selling writing grip recommended by doctors, teachers, and occupational therapists. 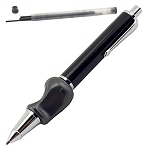 Developed by educational therapist Dr. Lois Provda, this pencil grip provides proper hand positioning, improves control, and increases comfort for writing. The design positions the thumb on the "R" for Righties, or "L" for Lefties, and allows the fingers to naturally fall into place naturally. 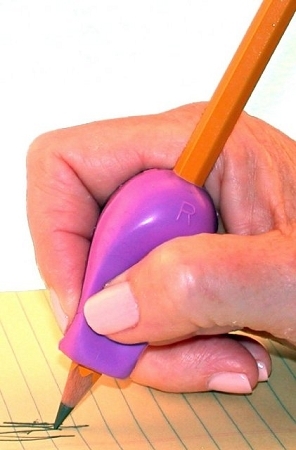 Over 90% of the surface of the grip is in contact with the user's hand to support and position the hand for writing. Right handed or left handed adults and children will find the ergonomic design helpful for comfortably and correctly holding pencils. Measures: 2 inches long, 1 inch wide. Materials: Soft rubber, latex free. Package of: 6 jumbo grips.